Winter COLD START Compilation: Semi-Truck Engines Turned On In Freezing Conditions! - Muscle Cars Zone! Winter COLD START Compilation: Semi-Truck Engines Turned On In Freezing Conditions! There is absolutely nothing like the amazing roar of a Diesel truck engine being cranked up in the freezing cold, so that`s why we decided to share this winter cold start compilation with you. We think this is the perfect moment to see such a video now when winter is at our doorstep. It really doesn`t matter if it`s a Duramax, a Powerstroke, a Cummins or a huge semi-truck. All of these machines sound downright insane when they are first started in the cold. However, in this video we will mainly focus on semi-trucks being cranked up for the very first time after being turned off in the freezing cold for a long time. Each of these semi-trucks has a pretty distinctive engine sound because of the different custom exhaust and engine setups they are all running. Maybe some of the semi-trucks in this winter cold start compilation sound almost identical because of the freezing air and huge exhaust. Watching regular cars being started in the freezing cold can be pretty awesome as well. However, we think it`s extremely difficult to beat the great sound of a huge semi-truck cranking up. The immense engines are struggling to fire at the beginning before finally cranking up and start to rumble to life. Witnessing such a thing delivers a very satisfying feeling indeed. There`s just nothing like it in the gearhead world. 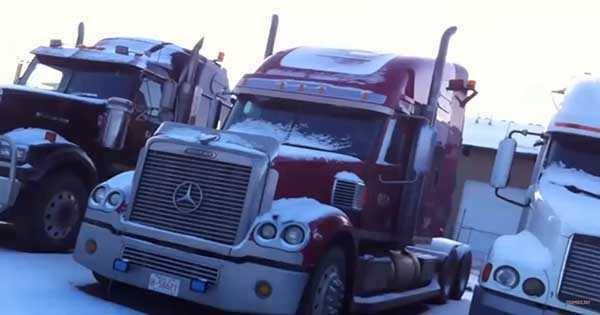 Apart from a Mercedes and a Ford semi-truck, it`s hard to see what the other semis in this video are. How to get Diesel engines to start when cold? Find out here!